Classic Monsters Dracula-Horror of Dracula (1958) Ultimate Guide - Choose cover! MyMovieMonsters.com > Monster Magazine Marketplace > Classic Monsters Of The Movies (UK) > Ultimate Guides > Classic Monsters Dracula-Horror of Dracula (1958) Ultimate Guide - Choose cover! Direct to us from the creators of Classic Monsters of the Movies magazine in the UK. 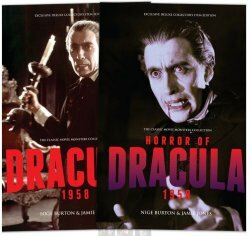 This third Hammer Horror Ultimate Guide is its first dual-cover publication: choose Horror of Dracula 1958 cover or Dracula 1958 cover! We ship same or next day so don't wait for the UK! The age of Hammer Horror redefined the way we looked at classic monsters. With Dracula (titled Horror of Dracula in the U.S.), the British studio turned the vampire count into a violent, athletic monster -- Bram Stoker's creation had a new lease of life, and horror cinema would never be the same. This lavish Dracula/Horror of Dracula 1958 Ultimate Guide magazine comes with two cover options, so you can choose the one you prefer. The content is identical. Join in celebrating the performances of Christopher Lee as Dracula and Peter Cushing as Van Helsing, together with the other cast and crew members who helped bring this classic to life. Authors Nige Burton and Jamie Jones examine the gothic atmosphere of Hammer Horror and the ways in which Dracula 1958 changed our perception of the character. 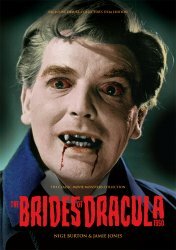 Any fan of the Hammer Dracula movies will love this guide to the beginnings of the series. This luxury publication is produced in full color, with stills, lobby cards and posters illustrating in-depth articles and biographies that throw new light on this classic horror movie. You'll discover fresh insight into the cinematic drama in front of the camera, and the close-knit team who worked behind the scenes. Collectors Note: You must choose your preferred cover at the drop-down menu above, while supplies last of each cover. To get both, add one to your shopping cart and return to this listing to add the other. Missed the Brides of Dracula Guide? Use the convenient Buy Both button below! Classic Monsters The Brides of Dracula (1960) Ultimate Guide - Hammer time!